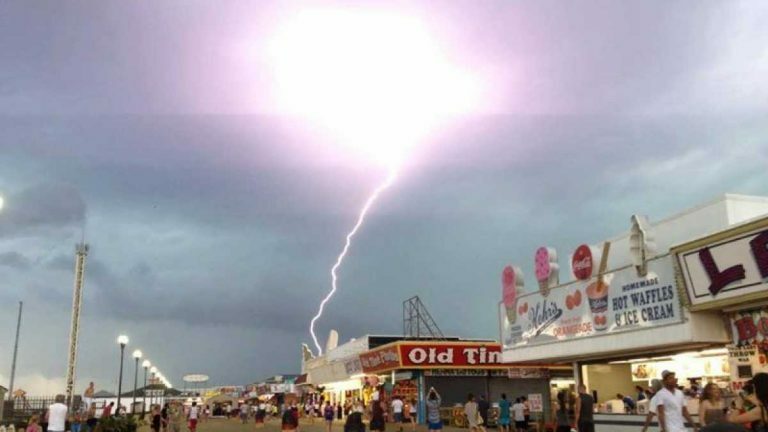 A lightning strike near the Seaside Height boardwalk as captured by JSHN contributor Jillian Speranza on June 24, 2013. More comfortable conditions follow tomorrow after today’s steaminess with possible thunderstorms later. A mixture of sun and clouds is overhead as of shortly before noon today. A chance of thunderstorms will increase during the afternoon hours through early evening, according to NOAA. The primary risks today are heavy rainfall and damaging winds. Temperatures will rise into the middle to upper 80s at the coast and lower 90s inland. Conditions are currently very humid and uncomfortable throughout the region. Any thunderstorms that develop will begin to diminish after sunset. By tomorrow, skies will become sunny after some patchy fog. Temperatures will be comfortable in the lower 80s, and a north wind will deliver drier air.